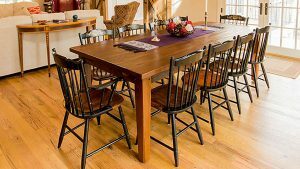 At Shenandoah Kitchen + Home, we painstakingly salvage old barns and agricultural buildings to re-claim wood, stone, tin, and square nails. We transform these materials to enhance the architectural details of your home. 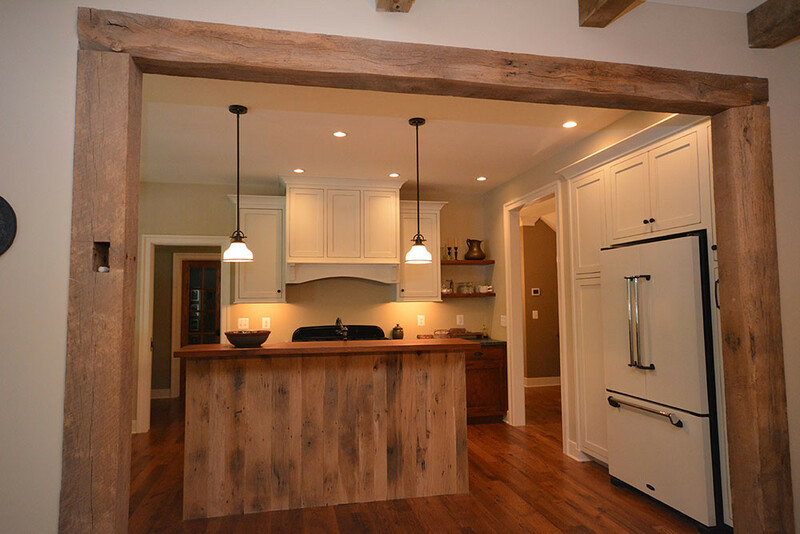 Reclaimed wood beams are a beautiful way to bring warmth and character to any room. These beams are hewed by hand with an axe from a round log. This ancient method of squaring timbers produces beams with a unique texture and bold axe marks, showing off the craftsmen’s skills. Used extensively in barns and log structures, we carefully salvage our hand-hewn beams, often preferred for decorative ceiling beams, rafters, posts, and mantels. As the requests and methods increased for providing larger quantities of building timber, beams sawn by large circular saws became the norm for construction of late 19th and 20th-century homes, barns, and other buildings. 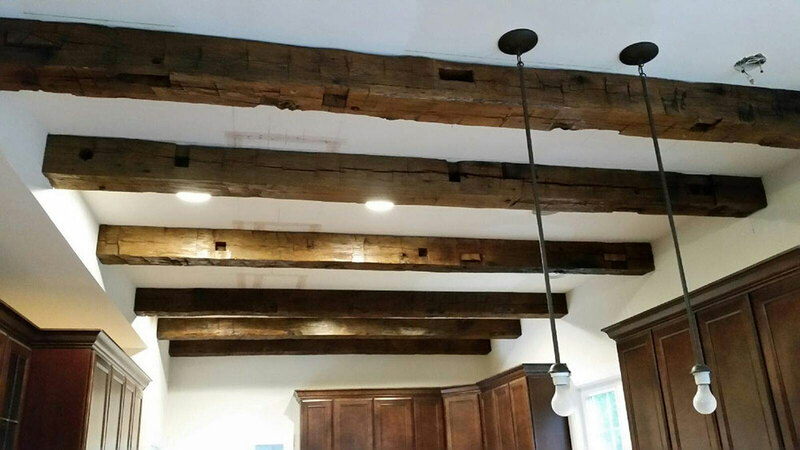 These beams, aged to rich gray-brown tones, boast a more uniform surface than our hand-hewn timbers. Frequently, used in much the same way for decorative purposes, these timbers are available in a wider range of sizes. The design team at SK+H can help you select the perfect beams for your project. Come and visit our showroom in Purcellville, VA and learn more about our beam selection and other wood elements for your home. 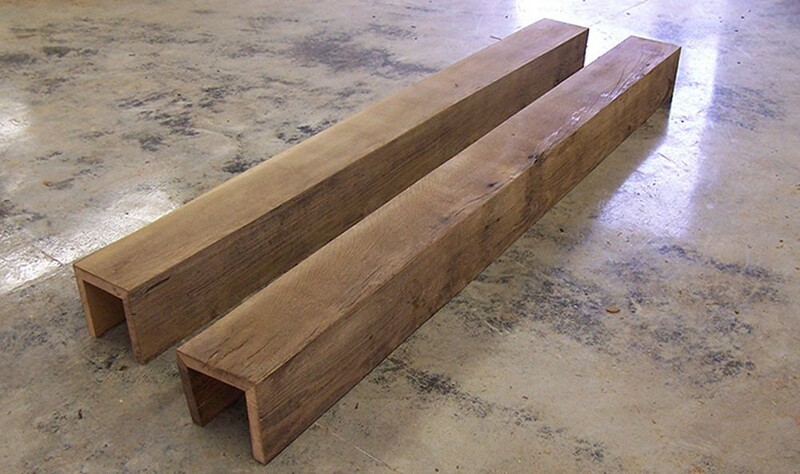 If you prefer the more refined look of re-sawn beams for your project, yet want to utilize reclaimed antique beams for environmental, aesthetic or old world quality purposes, then Antique Re-Sawn Beams are a wonderful solution. We have the ability to create several surface textures to match the look you are seeking. From rough sawn to planed smooth, to wire brushed or applied hand-hewing. 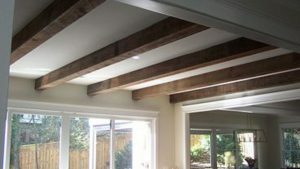 Faux Box Beams provide the look and feel of solid wood beams while at the same time being much lighter, requiring less structural support for installation. Our handcrafted wooden box beams allow you to still obtain the desired effect of solid wood beams without the worry of whether the structure will support them. Our box beams are created using a 45-degree locking miter joint for superior fit, strength, and ease of installation. Box beams are useful for hiding unsightly plumbing and conduit in difficult areas. We also provide complete box beam packages. Beams can be ordered pre-assembled or as parts. For times when using our solid hand-hewn beams are not possible, we offer our hand-hewn beam skins as a design solution. These “skins” are created by milling the face off of our hand-hewn beams to create a decorative plank that can be used for wrapping or boxing in hidden support structures. These hand-hewn skins are typically cut to a 3″ thickness and will have natural, as is edges. 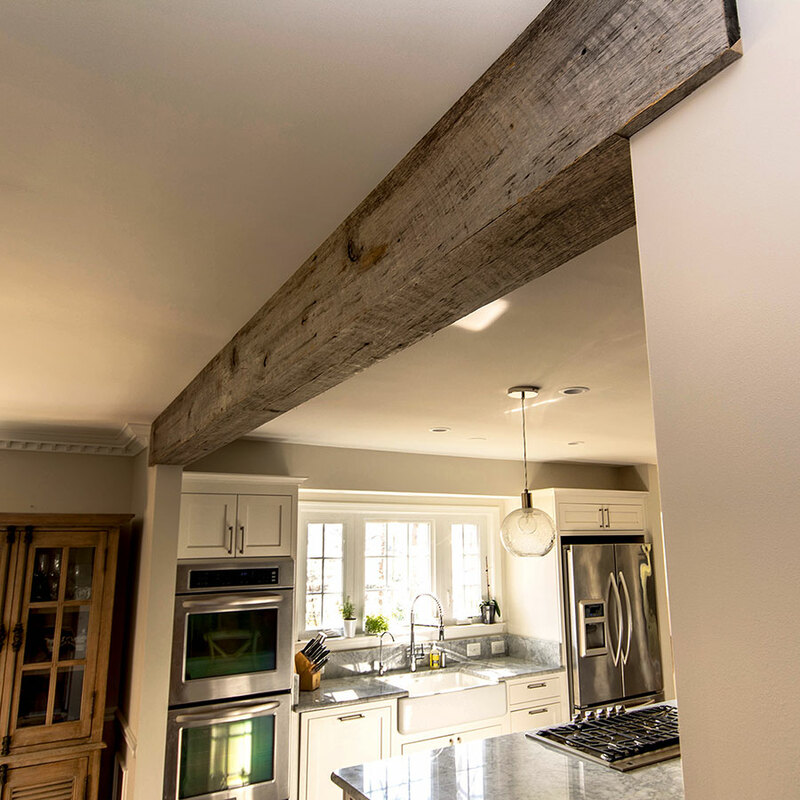 It’s amazing how something as simple as an antique barn beam can add so much character and warmth to a living space. 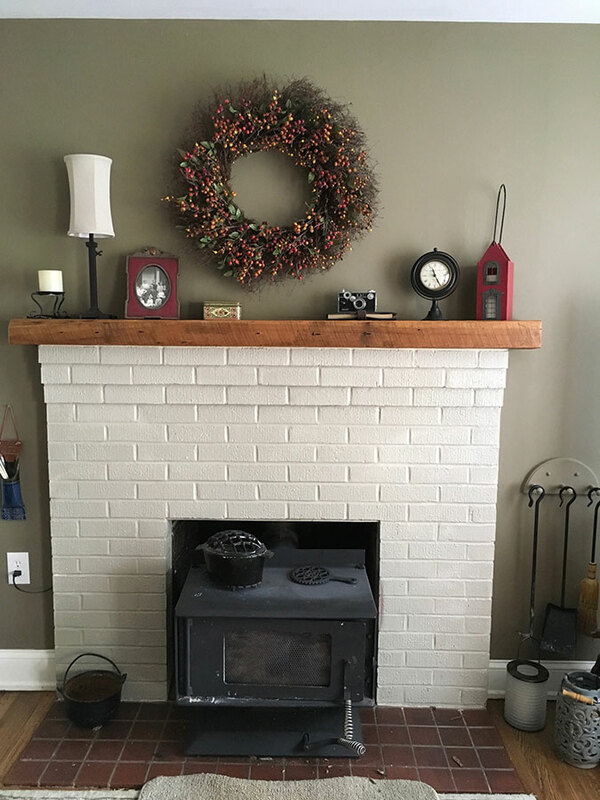 Shenandoah Kitchen + Home's gorgeous hand-hewn, rough sawn and re-sawn timbers make the perfect fireplace mantels and add a tranquil, natural element to rustic or modern contemporary interior designs. 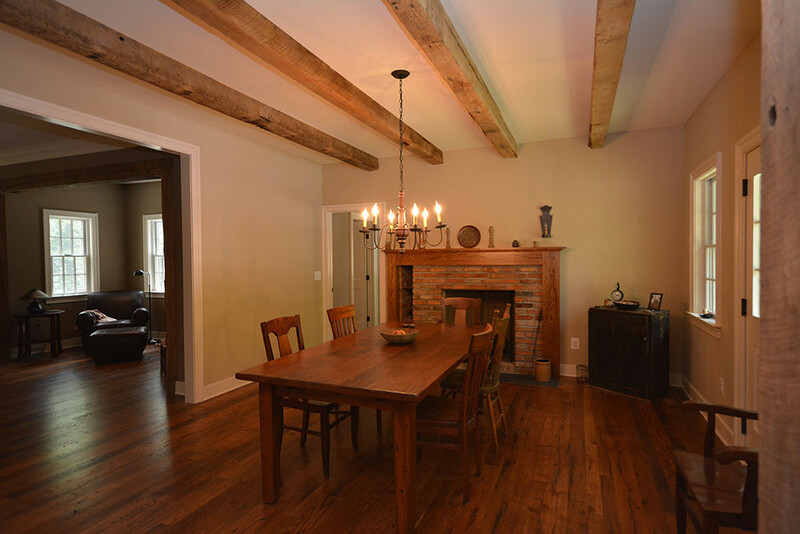 Our selection of reclaimed architectural beams is strikingly beautiful and structurally solid. 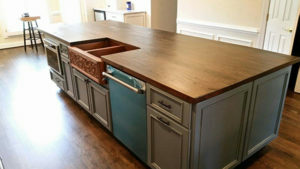 They maintain a look that is defined by the workmanship long ago that went into each precision swing of the craftsman’s axe or circular saw, whose hand-eye coordination produced expert squaring and spot-on straightness. 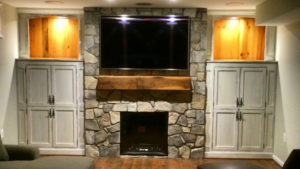 Our wooden fireplace mantels will be custom-cut to your specified length, surface de-nailed, kiln dried to ensure durability and sustainability, finished with a satin lacquer to enhance the woods natural beauty and create a surface that is easy to maintain. Every reclaimed beam is an organically unique structure. 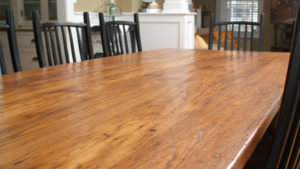 Our vast inventory lets you hand select the best piece for your space, then choose the surface type you prefer, including heavy or bold characteristics, smooth sides or special features, the favorite wood type and the size that meets your needs.